There can be no question that Buddhism is the one system, excepting perhaps science itself, which achieves an objective and detached view toward the nature and destiny of man. This striking objectivity divorces the Buddhist system from the realm of religion and allies it at once with the kind of scientific search for truth which characterized India in the Gupta and other early periods of its civilization and which affords a major preoccupation to most of the intellectual world—both east and west—of today. Buddhism, this writer contends, is not properly a religion; it is a system for life and living in a world which is circumscribed with difficulty and beset with suffering. Buddhism is not a religion, if, in scientific terms, we define religion as the mystic experience, the psychic thrill. It is not a religion because it de-emphasizes faith in the unknown and unknowable and it rejects dogmatism. However much these latter features may obtrude themselves in Buddhist lands, no serious student can regard them as other than superfluous growths, digressions from the scientifically conceived Dharma of the founder. This paper holds that in the strictest sense, Buddhism as a system and scientific endeavour as a comparable system are one. But there is also a difference: the Buddhist thinker is clear as to his aims; if he uses science and its methods, he does so with the realization that science is a means to an end and not an end in itself. In other words, the Buddhist sees in science reflections of principles expressed and reiterated by the Lord Buddha at a time when there was no absolute methodology of science as such. Since today the world is wedded to the methods of science, we have only to note how wholly compatible with science is the system founded in India over 2,500 years ago. Modern scientific achievement serves merely to lend added perspective to the concepts of impermanence, of the illusory quality, and of anatta which were put forth so long ago. As an end in itself, science may solve immediate problems; it feeds more people so that there are more people to feed; it prolongs life and finds more effective means of destroying life. Science as viewed today, is a method, no more, and to make a cult of it, to find in it the answer to problems and questions of the ultimate forms of human destiny is rank error. It is making a dogma of science where no religious emotion or attitude is ever intended. This indeed was the fallacy of some of the sectarian forms of ancient Hinduism: in seeking to explain the universe by means of an atomic theory, however correctly conceived, the Brahmins of India of the past stopped dead and found human salvation, if such it may be called, in science and sciencing. Nor is the contemporary world too different despite the fact that the scientific goal is material rather than spiritual. The method of science admits primarily the formulation of an hypothesis; the testing of that hypothesis, and the stating of new hypothesis, predicated on knowledge obtained by such experimentation. The Lord Buddha experimented with ideas, not with things—he employed the crucible of life in which to measure human experience and he came up with a detached and tested answer. Science is characterized by its tough-mindedness. The search for truth is not always easy, nor indeed, always pleasant. It has been said that the truth may hurt. It does, but it remains truth for all that. Pristine Buddhism offers an attempt, a successful one, it may be added, to come to grips with truth in an objective way. To those of us who, now living, are seeking a few moments of respite, of surcease from worry, in short, what might be called happiness, the Buddha says in effect: “All right, just remember, it doesn’t last; it may be here today but it is never permanent.” Just as science seeks to define its answers, objectively, without emotion, so also does Buddhism hit squarely at the target and, free from emotional stress, informs us concisely what is what. We may not like it and we may have to toughen ourselves to take it, but it is proven. An example of the kind of scientific “tough-mindedness” which the Buddhist has to take is seen in the concept of kamma. What indeed could be simpler and yet what could be more -scientifically conceived? If one chooses, one may take on faith, to be sure, the samsara principle. Objectively, however, previous existences, however envisioned in time or space, remain a matter of complete indifference. What is significant is that “I” am not the same individual that “I” was yesterday, a year ago, or even a moment ago. Ego has changed, physical form has changed, however imperceptibly. Moreover, the “I” of the individual, having volition, free will, can and does act. Acts, however, are pre-conditioned by foregoing acts. A deed of to-day begets its effects of tomorrow, effects of future action and thought. To the view of this writer, this is the karmic principle with meaning and application. It is scientific; there is nothing esoteric about it. 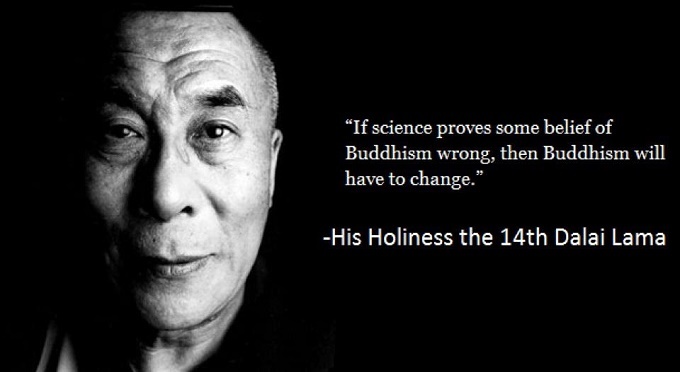 So much has been said regarding the relations between Buddhism and the natural sciences that it is scarcely worth belabouring the point further here. The nature of matter, the nature of physical reality, problems of space and time are all implicit in Buddhist teachings. This writer must confess that he cannot care less about such mystical relationships as are conceived as between mind and matter. His interests lie in the connections between Buddhism and the social sciences, that wide area which seeks to understand the relation between man and man, not that between atom and unpopulated universe. In such social sciences as anthropology and sociology, an attempt is made to understand how men behave in groups and why they act as they do. A related aspect is seen in economics and in its handmaiden, political science. Still further, may be added, the discipline which seeks to evaluate the individual, psychology. In all of these fields, one thought becomes paramount: human beings act because of their conditioning; the anthropologist would say because of their cultural heritage. We come to realize that what one people regards as right, another may view as wholly wrong. The social sciences teach the relativism of human behaviour. Granted that human behaviour be relative, it follows that there are no absolutes of good or evil. Indeed, good and evil, as concepts, are likewise wholly relative. As a trained social scientist, one who has information regarding the differing ways of the peoples of the world, the writer believes this. Only in Buddhism is some order restored from the resulting chaos. Note that the Buddha does not say: “Thou shalt not …” He does say that it is a good idea to avoid certain kinds of behaviour and he issues a series of wholly positive injunctions on his followers. Regardless of background, regardless of belief, regardless of economic or political systems, Buddhism has application. It makes sense as nothing else can to restore balance to men. Not that it is even desirable to effect a balance from the Buddhist point of view. To realize the concept of anicca is unquestionably for all men enough. But the Buddhist could assist his own goals by a realization of the objectivity of the social scientist. Here the scientist takes the view of detachment toward his fellow man. He does not seek amelioration. The Buddhist can and should do the same; by so doing, he may achieve by indirection solutions to the problem of human suffering. The Lord Buddha realized that the man who helped himself would inevitably help others. He comes concretely to grips with problems of society and personality. Psycho-analysis may in some measure be compared with enlightenment, but the enlightened man does not need to be told how to live with his fellows. The nature of enlightenment brings this inevitably about. The Buddhist can adopt the contemplative detachment of the scientist. In so doing, he makes himself a better Buddhist and follows infinitely more closely the basic precepts. Objectivity in human affairs remains his watchword. This article was republished from thewisdomawakened.com. You can find the original post here.